Small Animal Talk: Why are foreign bodies such bad news and why is intestinal surgery risky? Why are foreign bodies such bad news and why is intestinal surgery risky? Unhappy intestines. The foreign body is distending this dog's intestine, compromising blood supply. Radiographs can tell incredible stories, and often the best radiographic stories relate to foreign bodies: things that should not be inside animals that are inadvertently ingested. Every year, Veterinary Practice News runs their ”They ate what? !” imaging competition, to highlight the more unusual items dogs, cats and other species swallow. You can review the impressive results here, and nope, you don't have to work as a vet, nurse or student to interpret most of these x-rays. 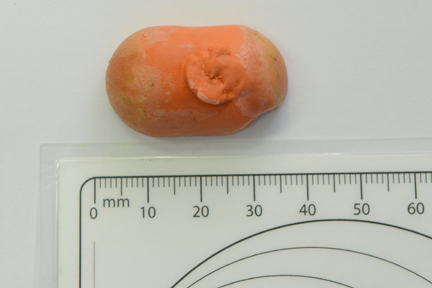 The foreign body once removed - a piece of rubber from a toy. Such as 26 golf balls (all swallowed by one dog). Or a fishing pole. Gorilla glue, hair ties, a plastic dinosaur, steel wool pads, teddy bears and rocks also feature. The radiographs presented give an indication of just how problematic foreign bodies can be, without the full-colour gore we see on the operating table. They make for great stories, but foreign bodies are life-threatening. As mentioned in the results of the competition, unfortunately not all of the patients made it. Why not? Even in the best hands, intestinal repairs can break down (the overall rate of intestinal incision breakdown, or dehiscence, is 12-16 per cent). The risk of such complications is much higher in animals over time, i.e. the longer the foreign body is present, the higher the risk. The risk is also higher in animals that are systemically unwell, septic or those who have had a previous surgery. There is a fabulous article by Sabrina Barry explaining all of this in the latest issue of Clinician’s Brief. Following surgery, intestine undergoes inflammation in the early stages of healing. Inflammation actually reduces the holding strength of the wound – so there is a real race between collagen breakdown and collagen synthesis. Barry recommends supporting tissue oxygen delivery to the GIT, minimising contamination, being mindful of vascular anatomy, minimising inflammation and ensuring vascular wound edges, engaging the submucosa during suturing (even though its softer than the muscular layer, the submucosa is the layer that maintains its integrity when other tissues at the wound edge have lost their strength), approximating submucosal edges, minimising the number of enterotomies, preserving the omentum and offering early nutrition. 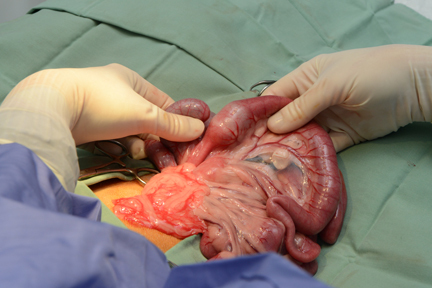 This is a lovely article and well worth a read for anyone who performs intestinal surgery. However, you can do all of these things and an intestinal incision can still break down. As Barry points out, intestinal incisions aren’t like skin incisions – we can’t inspect them regularly, treat them topically or just throw in a few additional sutures if we think the wound needs reinforcing. And foreign bodies can wreak total devastation on the gut, especially those with sharp or abrasive edges. Prevention is the best bet. Often, foreign body eaters are repeat offenders. I’ve surgically retrieved foreign objects from the same patient (almost invariably a dog) up to four times. They don’t associate eating the thing they ate with gut pain, nausea, hospitalisation or surgery. If you notice your animal swallowing things they should not in your presence, it’s reasonable to expect they will do so in your absence. Toddler-proof your home, lock your laundry basket, put the garbage bins out of reach, block access to the compost – it’s worth the inconvenience. And if you see your pet swallow something, seek immediate veterinary attention. Sometimes these objects can be retrieved by inducing vomiting or endoscopy, before they hit the intestines. Barry, SL (2016) Intedyinal incision dehiscence. Clinician’s Brief April 2016: 71-76.